With the new academic year underway, Emory's calendar is packed with a variety of engaging artistic, athletic and academic events. Check out these 10 activities to add to your agenda. With the new academic year under way, the calendar is packed with a variety of entertaining and educational events, including the return of popular series like the Emory Cinematheque Film Series and the John and Linda Cooke Noontime Concert Series. Of course, one of the benefits of being part of a university community is that most of these engaging activities are free or offered at a very minimal cost. 1. Be a fan in the stands at an Emory home game. Emory's fall sports teams are expecting strong seasons, so cheer on the Eagles at their first home events. All games are free at the Woodruff PE Center. Visit Emory Athletics for more information. 2. Experience a concert at the Schwartz Center for Performing Arts. Emory's Schwartz Center for Performing Arts is a beautiful performance venue for inspiring acts. September's free concerts include soprano Abigail Santos Villalobos at 8 p.m. on Sept. 11; Beethoven's Fifth at 8 p.m. on Sept. 26, performed by violinist Margeaux Maloney, Vega String Quartet, and pianists Elizabeth Pridgen and William Ransom; and organist Jeremy Filsell at 4 p.m. on Sept. 27. Tickets are not required. 3. Raise your cup to ancient Egypt at the AntiquiTEA. The art of ancient Egypt continues to exert influence. On Sept. 17, enjoy tea and scones with a discussion led by art history doctoral candidate Rachel Kreiter, using examples from the Michael C. Carlos Museum collection to illustrate ancient Egyptian influences in contemporary art. The first AntiquiTEA of the semester is set for 4-5 p.m. in the Reception Hall on level three of the Carlos Museum. Look for more events in the series throughout the year; the next is set for Oct. 15. 4. Enjoy a film screening or cinema discussion. The Emory campus enjoys two back-to-back film events this month. The Department of Film and Media Studies hosts internationally acclaimed Israeli film director Eran Riklis as a Schwartz Foundation Artist in Residence through Sept. 11. Film screenings began in August, but you can still catch "Lemon Tree" on Sept. 2 at 7:30 p.m. in White Hall. Riklis also presents three lectures this month: "Israeli Cinema: The Way We Were" on Sept. 1 and "Israeli Cinema: Forging an Identity" on Sept. 8, both at 7:30 p.m. in the Jones Room of the Woodruff Library, plus "Of Conflict and Optimism: My Personal Cinematic Voyage" on Sept. 10 at 7:30 p.m. in the Carlos Museum Reception Hall. All of the events are free, with receptions following the lectures. Next up is the return of the Emory Cinematheque Film Series, which focuses on Japanese anime this fall. Screenings take place on Wednesday nights at 7:30 p.m. in White Hall Room 208, beginning Sept. 16 and continuing through Dec. 2. Films are free and include free popcorn. 5. Have a concert for lunch. Use your lunch break to nourish your love of music with the return of the Emory Chamber Music Society of Atlanta's John and Linda Cooke Noontime Series. On Sept. 18 from noon to 1 p.m., enjoy the "Best of Beethoven" with Jessica Wu, Guang Wang and William Ransom. These free concerts are held in the Reception Hall of the Michael C. Carlos Museum; arrive early as they usually fill fast. 6. Take a swim or race a duck at the SAAC. SAAC, the Student Activity & Academic Center on Clairmont Campus, hosts a Laid Back Labor Day party from 11 a.m. to 2 p.m. on Sept. 7. And with most public pools closing after Labor Day, remember that the SAAC pool remains open through Nov. 1 and is heated during October to keep the water a minimum of 78 degrees. You can also have fun at the SAAC while raising money for a good cause on Sept. 19 from 1-3 p.m. for the Dr. Paul M. Fernhoff Memorial Ducks for Bucks Race. The Lysosomal Storage Disease Center of Emory School of Medicine's Department of Human Genetics is working toward its goal of $1 million for the Fernhoff endowment. You can sponsor as many rubber ducks as you want for $5 each, then bring a picnic to the SAAC on race day to see if your ducky (with the help of human kickers to keep the water moving) crosses the pool finish line first, making you eligible for cool prizes. 7. Celebrate in the streets of Emory Village. The third annual Open Streets DeKalb at Emory Village features a circus theme, closing the streets of the popular shopping area just outside Emory's main gate from 3 p.m. to 7 p.m. on Sept. 20 for an afternoon of family-friendly fun. Look for high school bands, drummers, a cappella and choral music, face-painting, a bouncy house, treats from Village businesses, a climbing wall and even a pet-owner look alike contest. Emory University is among the sponsors for this free event. 8. Attend a lecture to learn more about a topic that interests you. The start of the new academic year brings a variety of lectures from Emory faculty and guest speakers on topics ranging from religious history to quantitative biology, sporting cultures, dance and much, much more. Pick a topic that aligns with your field of study or professional expertise, or try something completely different. Here is a sample of free public lectures this month; find more on the full Emory events calendar. 9. Take a walk with your colleagues on the Emory campus. Walking is a great way to add exercise to your day, and this fall, Emory employees have an additional incentive to get in a few extra steps during work breaks: a bit of friendly competition. Registration is underway now for the Move More Challenge, which kicks off Sept. 21 and runs through Nov. 15. Employees will wear Fitbits to track their steps and will join teams to compete with co-workers. Participation is free; you can use your own Fitbit or purchase a new one at a reduced price. Whether you are participating in the Move More Challenge or just want to get out of the office to enjoy the fall weather, don't forget to mark your calendar for the return of Meet Me @ Lullwater Preserve, weekly walks through Emory's beautiful campus nature preserve. Walkers meet at noon on Wednesdays at the Lullwater gates, Sept. 23 through Oct. 28; you can walk on your own or with the group for activities and themes. As if September's calendar isn't packed enough, the month concludes with Emory's annual Homecoming Weekend, Sept. 24-27. A wide variety of events are planned; most are free, including several of the biggest events on Saturday, Sept. 26, dubbed "Spirit Day." If you're in the mood to get up early, Emory faculty, staff, students, alumni, family and friends can register at no cost for the Homecoming Intramural 5K in Lullwater Preserve on Saturday morning, with prizes awarded to male and female winners in five age groups. At 1 p.m., the Big, Bold, Blue and Gold Homecoming Parade steps off, then at 2 p.m. doors open for the Homecoming Festival and Concert on McDonough Field. 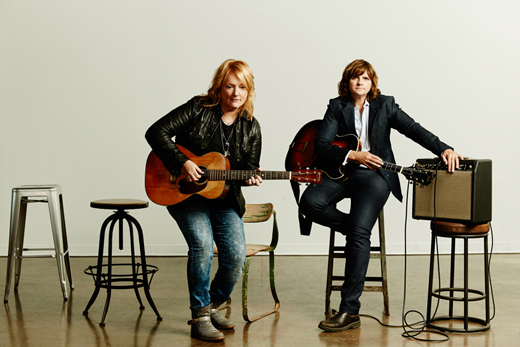 Indigo Girls, made up of Emory alumnae Amy Ray and Emily Saliers, take the stage at 3:30 p.m.